NASA satellite image of the South Keeling Islands, part of the Cocos (Keeling) Islands archipelago in the Indian Ocean between Australia and Sri Lanka. THE COCOS (KEELING) ISLANDS lie in the eastern Indian Ocean, about 2,900 kilometres northwest of Perth, Western Australia. It is about halfway between Australia and Sri Lanka. Comprised of coral atolls and islands, the archipelago includes North Keeling Island and the South Keeling Islands. Total human population is about 600. 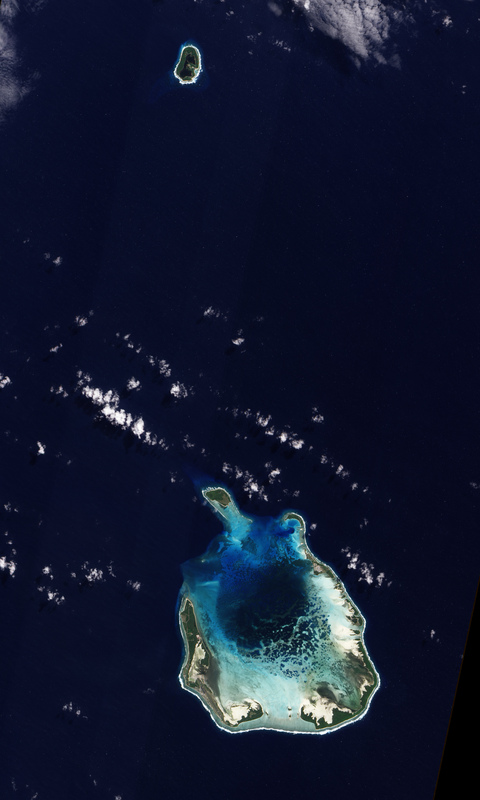 The Advanced Land Imager (ALI) on NASA’s Earth Observing-1 (EO-1) satellite captured this natural-colour image of South Keeling Islands on July 31, 2009. Coral atolls—which are largely composed of huge colonies of tiny animals such as cnidaria—form around islands. After the islands sink, the coral remains, generally forming complete or partial rings. Only some parts of South Keeling Islands still stand above the water surface. In the north, the ocean overtops the coral. Along the southern rim of this coral atoll, the shallow water appears aquamarine. Water darkens to navy blue as it deepens toward the central lagoon. Above the water line, coconut palms and other plants form a thick carpet of vegetation. Close up satellite image of the runway on the Cocos (Keeling) Islands. NASA Earth Observatory image created by Jesse Allen and Robert Simmon, using EO-1 ALI data provided courtesy of the NASA EO-1 team. Text adapted from information issued by Michon Scott.